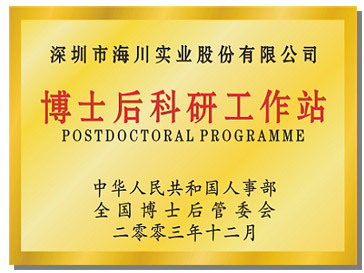 Postdoctoral Programme of OCEANPOWER COPORATION was founded in November 26, 2003 and authorized by Ministry of Personnel, People's Republic of China (74). With our tenet of "Quality, Service, Reputation", Oceanpower Corporation keeps challenging new difficulties and strives toward perfection, with the goal of creating a better tomorrow. We welcome all promising talents and experts to our company. Persisting to the philosophy of all rivers belong to the ocean, open mind is great? we will continuously improve our postdoctoral program and station, to create an environment for great achievements both in academic and personal comprehensive ability. Therefore we will have a double win target between the individual and the corporation. Postdoctoral Programme of OCEANPOWER COPORATION have set up an advanced R & D platform that will attract and train staff of high-level researchers, promote the combination of production, teaching and research, for the improvement of the tech-innovation and marketing capability of Oceanpower group. Postdoctoral Programme of OCEANPOWER COPORATION is main aims are to study and research important strategic and prospective topics on the following fields: civil engineering, novel material science and technologies, environmental science and engineering, optical-electrical-mechanical and digital color technology, attract and train specialists, and finally develop to a top-level postdoctoral program. In the coming five years, OCEANPOWER COPORATION would like to offer as much as 8% of the company gross income every year for R & D fund as well as the Postdoctoral Program. So every technical staff that is involved in R & D will have a good chance to improve and finally reach perfection. Also The Engineering Research Center of Architectural Coatings, Ministry of Construction, P.R.China (ERCAC), the testing center and other basic establishments, can increase the equipment investments on the basis of more than two million RMB so the scientific research equipments will be up-to-date. All laboratories will pass the accreditation for laboratories by the CHINA NATIONAL ACCREDITATION BOARD FOR LABORATORIES (CNAL). The total investment of equipments will exceed fifteen million RMB. This is to continuously perfect and strengthen the management system and to increase scientific research encouragement. The research & development upon the advanced polymer and macromolecule material, as well as the application technologies in civil engineering novel polymer. The research & development upon the advanced technology in the field of municipal water and wastewater treatment. The research and development of national standards and involve in international standards. Oceanpower Corporation pays high attention to Research & Development. Its R&D system includes a Research & Development institute, The Engineering Research Center of Architectural Coatings, Ministry of Construction, P.R.China. (ERCAC) and Postdoctoral Programme of OCEANPOWER COPORATION The related research fields are new macromolecule materials, advanced engineering materials and application technology, environmental waste and pollution treatment technology and research of digital color technology. At present time there is seven specialized laboratories, a national engineering research center and a science and technology information center which has collected more than two hundred thousand books . Oceanpower Corporation has drafted out or participated in creating 15 China National Standards and China Professional Standards, of which 4 China National Standards already have been implemented in today's system, 4 China National Standards are being prepared and Oceanpower Corporation participated in the creation of 7 China National Standards and China Professional Standards. As great achievements upon the standardization Oceanpower have been selected as one of twenty two of demonstration enterprises around the country authorized by the Ministry of Science and Technology of the People's Republic of China, Standardization Administration of P.R.China and General Administration of Quality Supervision, Inspection and Quarantine of P.R.China in February 2004 as part of the national key standardization program. At the end of 2004, Oceanpower Corporation had applied 350 patents and 150 authorized patents. Only in 2003 Oceanpower Corporation applied for 152 patents (including 117 invention patents), and nearly 80% were new invention patents. Oceanpower Corporation was ranked 25th amongst the national enterprises, ranked 5th in Guangdong province and ranked 4th in shenzhen for the quantity of patents in 2003. After evaluation of this accomplished project, experts of Ministry of Construction, P.R.China regard the project as one of the most advanced work in the world. The Color Tinting System is a software including series of functions of Color-detection Control, Formula Database Management, Formula Calculation, Formula Search, Color Tinting System Control, etc. By the improved Kubelka-Munk model, the artificial neural nets model, the nonlinear 3D search model, etc., the system integrates the color-detection hardware, formula database search algorithm, specific formula prediction model and remote debugging colors based on Internet. It is suitable for the applications, used by coatings enterprises both domestic and abroad, Color Tinting Chain Shops. And it owns more advantages than the traditional technology in terms of automation, accuracy, efficiency, cost etc. in the fields of color paint production. Shenzhen Oceanpower Chemical Co., Ltd and one famous fiber manufacturer in Europe developed the polyacrylonitrile fiber. After several years'gaining civil engineering experiences we systematically developed an understanding related to the anti-crack, antifreeze and anti-penetration performance of fibers in wall coatings system, the dispersion and the application technology. According to the characters and functions of different exterior coatings, the guideline and the parameters such as the classification and the addition content of the fiber that can be obtained. The experts in Ministry of Construction, P.R.China, appraised this work to be internal leading. The positive/ negative charge center of the natural polarity mineral cannot overlap together. Due to the dipole moment, the minerals still take the charge. When adsorbed on the minerals, vapor will decompose into H+ and OH-. H+ and OH- can combine into H3O2- negativeion, which can react with the "bad?positive ion such as formaldehyde or benzene. This reaction can be of great benefits, and applied in for example air cleaning, improvement of the body immunity system, faster recovering from fatigue etc. However, if you would like to apply the materials into the architectural coatings, then you must be well aware of the key technologies such as the powder diminishment, the choice of optimized intermingle lanthanum, the surface treatment, the slow-releasing of coatings, the dispersion of negative ion powder in coatingsetc. In this project, the current shortage situation of water resources in our country is considered. Following conclusions connected with the application of current water treatment and existing problems is summarized. UV technology such as light strength, dosage measurements and calculation is studied and the goal is to find the proper way for safe disinfections in circulating water of environmental architectures. In order to satisfy more and more complicated reinforcement requirements, we should try to make use of the strength of AFRP, to enlarge the application arrangement of AFRP and to promote the further application and development of AFRP in the field of engineering reinforcement. This project will take references of the advanced international tension equipments. These references will then be used for the further development of the tensioned, anchor fixture and the final goal is to produce our own product and to have the property right for it. We mainly research the anchor fixture system, which brings the pre-stress to AFRP textile, and the reinforcement technologies of pre-stressed AFRP textile. Two-component polyurethane coatings owns excellent mechanical performance (such as high film hardness, strong adhesion and high wear-resistance), perfect chemical resistance and weather ability, and low temperature film forming property. Waterborne two-component polyurethane coatings integrates the high performance of solvent-type two-component polyurethane coatings and the low VOC release of waterborne coatings. It can be used in high-class exterior wall coatings, leather coatings, automobile coatings, plastic coatings, industrial coatings and resistance eroding coatings etc. It satisfies different requirements, and becomes the focus of the research in the coatings field. The key technologies of this project are to develop and perfect the high performance defect-free waterborne two-component polyurethane coatings, to develop the high solid content waterborne resin with hydroxyl. By the introduction of special functional molecule structure into polyurethane chain according to the designable character of polyurethane molecule, more functions of polyurethane films could thus be accomplished, as well as the final performance improvement.